Piers are an extension of community and attract all walks of life - fishermen, young and old couples in love, and those who love a scenic stroll. Daytona Beach is home to two of the six wooden piers that exist in Florida today. Located just a few short miles from each other, each pier has a story to tell and beckons its own family of visitors to return year after year.Piers make great photo ops and odds are better than good that you&apos;ll capture some playful dolphins, majestic seabirds and surfers playing in the ocean waves. Lucky for Daytona Beach visitors, our piers also provide a nice sanctuary from the sun. 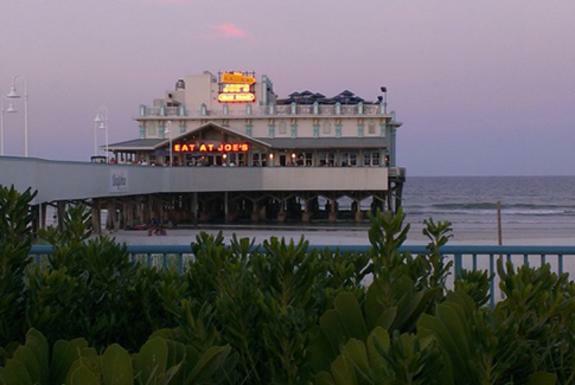 Restaurants are perched on both of our iconic piers - if the sign says Crabby Joes, then you&apos;re on the beloved Sunglow Pier; if it says Joe&apos;s Crab Shack then you&apos;re on the "grand dame" of piers - the Daytona Beach Pier. It has been a memory-making mainstay since 1925. At 1,000 feet, the Daytona Beach pier, centrally located and surrounded by the famous boardwalk amusements area, is one of the area&apos;s most recognizable landmarks. Sunglow Pier is a little off the beaten path and located further south in Daytona Beach Shores. It&apos;s weathered its share of storms since 1960 and comes in under just 1,000 feet. To get to the pier, fishermen walk through the restaurant which makes for a nice casual vibe and offers diners a peek at today&apos;s catch. After all, the sign does say, "No Shirt, No Shoes, No Problem." If you go to the Daytona Beach pier, be sure to also check out "The Roof." It&apos;s a restaurant located just above Joe&apos;s Crab Shack and extends your view into blue magnificence. Both offer delicious house specialties. If you&apos;re looking for someone to cook your catch, you can bring it to Crabby Joe&apos;s and they&apos;ll fry up a basket for you. Pier anglers catch a wide variety of fish that includes Whiting, Kings, Pompanos, Flounder, Trout, Spanish Mackerel, Sheeps Head, Blues, Sail Cat, Tarpon and a variety of shark species. Fishing is allowed on the east end of the pier. There is no cost to fish and fishing licenses are not required. From March 16 to October 31, hours are 7 a.m. to 7 p.m.
Sunglow Pier opens for fishing at the crack of dawn, at 6 a.m., and closes at 10 p.m. Adults, $7 + tax; children 12 and under $3. Pole rentals are $2.